We’re leaving right after work tonight for our vacation home in Virginia. We won’t be taking the laptop (and we don’t have internet access there anyway) so the blog will be quiet for a week. I have planned out meals and have made arrangements to get together a walking group in our trailer park, so fingers crossed when I return I’ll be in Onederland. D – protein bar – we’ll be on the road. More than likely I’ll fix a hot dog or something when we get to the trailer. Exercise – walking today on my lunch hour. Exercise – 30 minutes on the elliptical, 10 minutes hip flexor exercises, and 20 minutes lower body strength training…and ow. ow. ow. Post dinner – 16 oz water. My wedding rings have literally been falling off of me. They were sized at a 9 – both the engagement and wedding band. I was terrified that I was going to lose them. Back when I first decided to have surgery, my husband promised me a new wedding band when he could afford it. Now, I love my bands. My engagement ring is beautiful – marquis cut with channel set diamonds on the band. 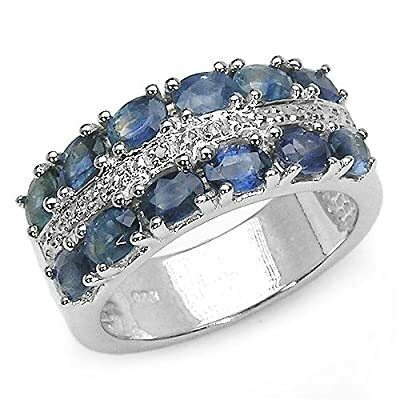 The wedding band was prong set, alternating sapphire and diamond half eternity band. I was content with getting those bands resized until my husband could afford to get my the wedding band I really wanted. Well, my birthday is coming up next month. Bob asked me what I wanted, and since my rings have been falling off, I asked him that if I could find a ring that was $100 or less, would he replace my wedding band now? Of course he said yes. And so….I found a ring that I loved loved loved on amazon.com. It’s sapphire and diamond – two rows of sapphires with a row of diamonds in between. It’s sterling silver (my old bands are white gold). And it’s a size seven. SEVEN! Bob ordered it for me and it arrived today. I LOVE IT! And it slipped right on. A size 7 ring. Yayayay! And so, I’m putting the engagement ring and wedding band away. I will have them resized eventually, and I’ll wear the engagement ring on special occasions. The new ring is really big enough that it would look odd with my engagement band. But I’ve gone from a size 9 to a size 7 ring. Yay! 9 months out – 200 pounds – down 104 pounds from surgery and 121 pounds total.